Recipe Copyright © 1995 Kasma Loha-unchit. Coconut Egg Custard (Sangkaya) is often sold as street food. You might enjoy Kasma's article on Thai Street Food. Heat the coconut cream and palm sugar in a saucepan just enough to dissolve the sugar and blend with the cream into a smooth mixture. Allow to cool to room temperature. Beat the eggs well and mix in with the cooled, sweetened coconut cream. If you wish, add a few drops of flavor essence. Stir well. Strain the mixture through a dampened muslin cloth, or through a fine wire mesh colander. Spoon out any bubbles that may have formed over the top. Pour the mixture into a heat-proof dish or a hollowed out yellow squash (see Notes & Pointers) with a small round opening cut on top. Steam over medium-high heat until the custard is set, about 20 minutes in a dish, and up to an hour to an hour and one half inside a squash, depending on its size and thickness. Let cool. Test doneness by sticking the blade of a small knife into the middle of the custard, feeling as you do whether it is firm all the way through. There should be no fluid oozing out from the cut and the knife should be clean. If steamed by itself, spoon the custard into serving bowls and serve at room temperature. The sweet custard is more frequently served as a topping over coconut-flavored white sticky rice (see sticky rice recipe ). If steamed in a yellow squash, Let cool on the steamer rack before transferring gently onto a serving platter. slice the squash and custard into wedges like you would a cake. 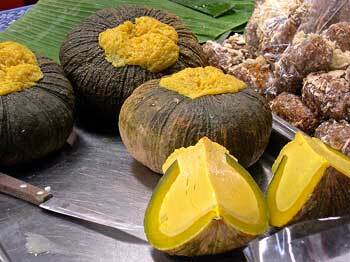 The custard is wonderful eaten along with the golden squash. If using a squash, lightly scrub and rinse the outside of the squash to clean. Using a sharp knife, carve a small round opening on top (the stem end). If you are using a squash other than kabocha and it is pointed on the other end, slice off enough of the tip so that it can sit well balanced on a flat surface with the opening directly on top. Remove the seeds and strings inside. If you are good at fruit and vegetable carving, carve a pretty design on the outside surface. Place the squash on a steamer rack over a pot with boiling water. Fill the cavity with the coconut mixture. Cover and steam on medium heat for 1 to 1 1/2 hours, depending on the size and thickness of the squash, or until the custard is set. If you wish the convenience of canned coconut milk, the Mae Ploy brand from Thailand contains the most cream. Do not shake the can before opening as the cream floats. Spoon a cup of the thickest cream off the top of the can and use it in this recipe. Kasma does not teach this recipe in her classes. She teaches another custard – Baked Coconut-Taro Cream Custard (Kanom Maw Gkaeng Peuak) – in the Evening Series Advanced Set E-3. Recipe Copyright © 1995 Kasma Loha-unchit in It Rains Fishes. All rights reserved.